New C.K Masonry Drill Bit Sets – how do you keep yours? Finding the right drill bit quickly and easily is critical to any construction-related job and broken or lost drill bits can lead to costly downtime. Now, C.K is set to solve this problem with the launch of three Masonry Drill Bit Sets. 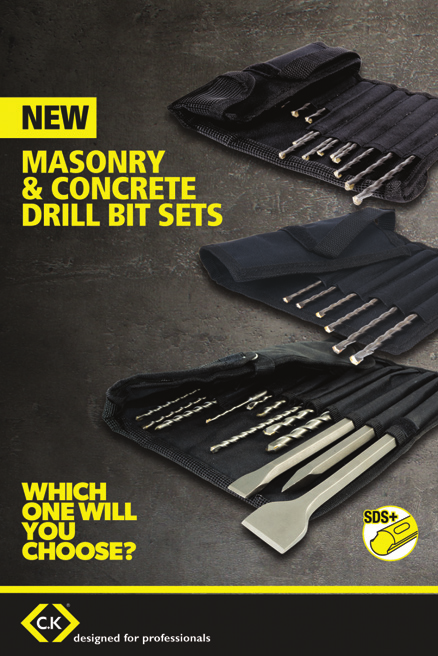 These sets feature the most frequently used drill bit sizes, all supplied in a roll up storage case which not only provides a convenient long term storage solution, but also ensures frequently used sizes are always close at hand. ● T3131 Masonry Drill Bit Set of 25. ● T3132 SDS Concrete Drill Bit Set of 14. ● T3133 SDS Concrete Drill Bit & Chisel Set of 15. Manufactured to the highest standards, the new C.K Masonry Drill Bit Sets are all tungsten carbide tipped, providing speed, performance and endurance, to complete any job quickly and effectively.